This is a study of nine key film-makers who came into prominence in the early ‘70s: Claude Chabrol, Pier Paolo Pasolini, Lindsay Anderson, Stanley Kubrick, Andy Warhol and Paul Morrissey, Satyajit Ray, Miklos Jancsó, and Dušan Makavejev – representing seven film-producing countries. 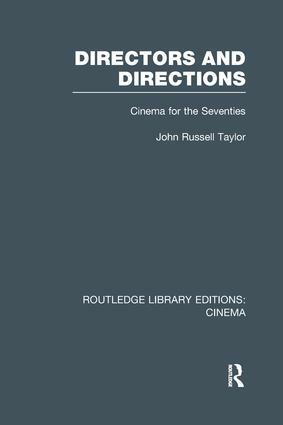 In this book John Russell Taylor does for the 1970s what his earlier book Cinema Eye, Cinema Ear did for the 1960s: he disentangles some of the major talents from the minor, and subjects them to close critical scrutiny, documenting their careers, detailing their development as individual creators, and placing them in their social and artistic context. Thus the book provides an invaluable synopsis and guide for all who are interested in the development of modern cinema. It includes a comprehensive bibliography and fully detailed filmographies. Reissuing works originally published between 1914 and 1996, Routledge Library Editions: Cinema offers a selection of scholarship covering the movies. Volumes range from film propaganda to the epic film genre, women in cinema to Soviet cinema, silent film to horror series, and touch on acting, screenwriting and film production among other areas making this a comprehensive collection of previously out-of-print works.